My Thanksgiving dinner tips and a recipe for cinnamon snack mix – perfect for parties or snacking! With Thanksigiving right around the corner, I bet there is more than one of you freaking out a little about hosting this year. I remember the first holiday dinner I hosted very well. It went okay because I’m a control freak and wouldn’t let anyone help me. I ran around, frantically making sure everyone was eating and enjoying themselves. I didn’t even notice that the dog snuck off with my perfectly cooked turkey. Now when I host I try to do as much planning as I can ahead of time. How else am I going to keep an eye on the dog? Read on below for a few more Thanksgiving Dinner Tips and a fun and delicious recipe for cinnamon snack mix. Make lots of lists. From guest lists to grocery lists, I have found list making is my friend when it comes to hosting Thanksgiving dinner. Start with your guest list – if you aren’t sure who is coming, now is the time to start making phone calls to family members or friends. And since it is Thanksgiving, ask if anyone is bringing a guest with them. Why not open your home to that new boyfriend or that new neighbor from out of town? Once you have a rough guest list, you can make your menu and grocery lists. Make food ahead of time. 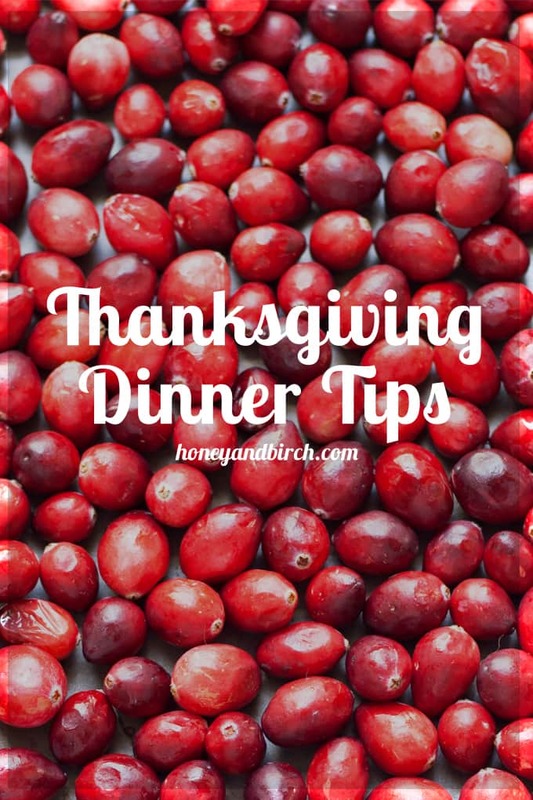 Some recipes, like stuffing or cranberry sauce, can be made days in advance and stored in the freezer. Stock up on Hefty freezer bags when you do your grocery shopping and plan an afternoon a few days in advance to get some of your meal prep done. If you are making any dips, cut up your veggies and store in Hefty storage bags for one less task to do on Thanksgiving Day. Eat. You may think this is a silly tip, but come Thanksgiving day you may find yourself getting tired midday if you don’t remember to eat something in the morning. 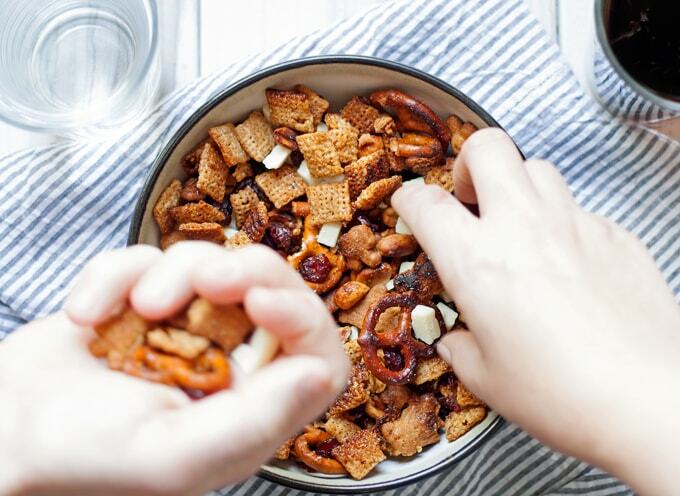 Snack on the below recipe for cinnamon snack mix when you’re looking for an energy boost midday. It’s always a crowd pleaser, so make a double batch and serve it alongside your holiday appetizers! Plan for leftovers. My family is full of big eaters but we are also big cooks. Because of that, there is never a shortage of leftovers. We used to rotate plastic containers depending on who was hosting but have gravitated towards doling out leftovers in Hefty storage or freezer bags. Their flexible nature makes them the perfect container for a myriad of leftover sizes and shapes and makes fitting them in the fridge or freezer an easy task. 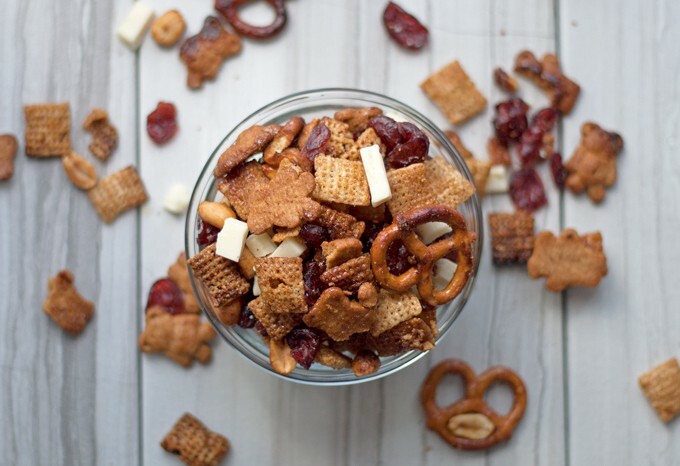 This recipe for cinnamon snack mix is a delicious blend of crunch, salty and sweet with the added delcisious spice of cinnamon. It can easily be doubled or tripled and makes a great snack or Thanksgiving appetizer thanks to the addition of dried cranberries! This is a recipe you can add to your make-ahead list and freeze it for future snacking in a Hefty® Freezer Slider Bag! 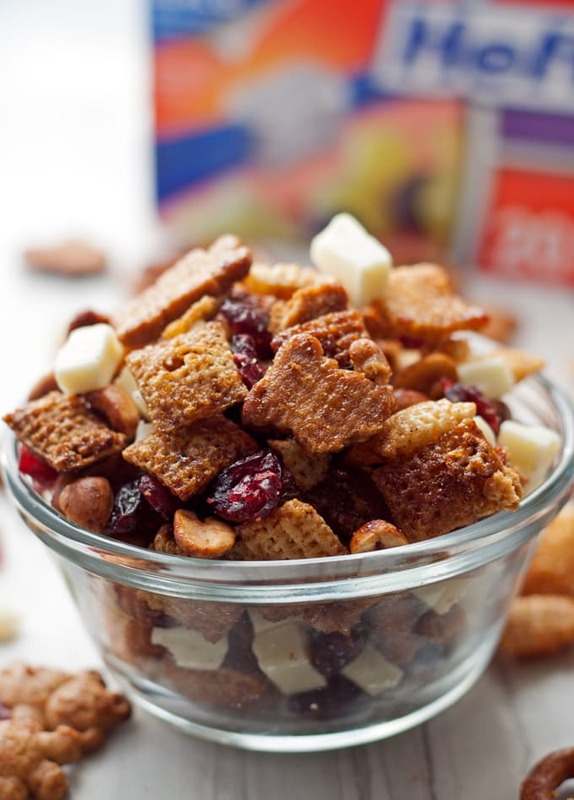 Try this cinnamon snack mix recipe - full of rice cereal, pretzels, graham crackers, cranberries and white chocolate! In a gallon Hefty storage bag, combine the rice cereal, graham cracker bears, pretzels and peanuts. Shake well until well mixed. In a small bowl, combine the melted butter, agave nectar and cinnamon with a whisk. Pour butter mixture over the cereal mixture inside the storage bag and shake well. Pour out of bag and onto a baking sheet. Bake in the oven for 10 minutes, stirring once at 5 minutes. Remove from oven and allow to cool. Split the snack mix into two Hefty quart storage bags, breaking up the snack mix with your hands through the plastic. Add the white chocolate and dried cranberries to the bags and shake well. Eat immediately or store in Hefty freezer bags to enjoy later. 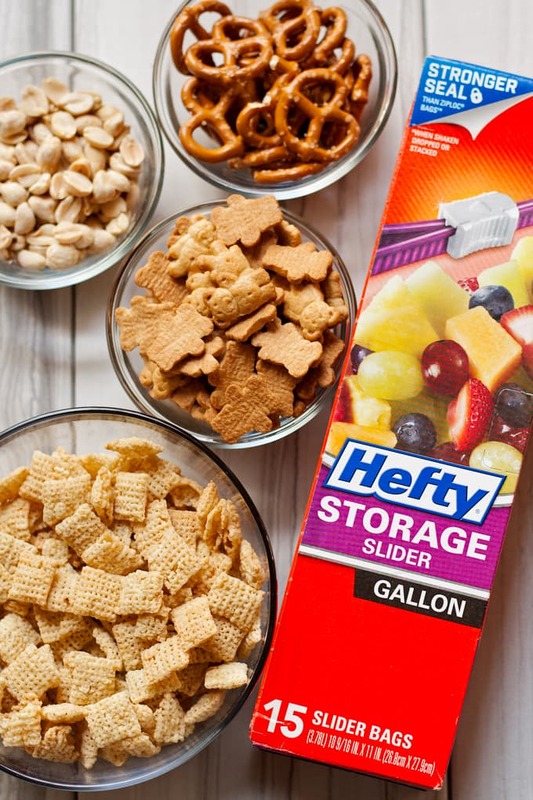 Hefty brand products not only include Slider Storage and Freezer Bags, but also trash bags and tableware. Discover how Hefty can help you with home solutions today. Fun Thanksgiving ideas for kids using Hefty products! I like GOURMET BACON IN A BAG. I’m going to try some of their tips for preparing the turkey. I’d like to try the Hefty Batty Bites Popcorn Mix even if it is past Halloween, lol. I want to try the Hefty Batty Bites Popcorn Mix for next Halloween. Although it’s past Halloween, I like the BATTY BITES POPCORN MIX. It makes for a good snack! I want to make Hefty Batty Bites Popcorn Mix (even if Halloween is over). I would love to make the puppy chow in a bag! Probably the gourmet bacon, yum! I like the gourmet candied bacon in a bag. I’ve never done it myself, but I’ve always wanted to make puppy chow – and thanks to Hefty, I know how! Thanks! My favourite Thanksgiving morning recipe would have to be the “Gourmet Bacon in a Bag”!!! I love bacon, and try to eat it as much as possible over the holidays!!! I am going to make the GOURMET BACON IN A BAG recipe. It looks so delicious! The Gourmet Bacon in a Bag sounds good. I want to make the Bites Popcorn mix recipe. I like the recipe for Puppy Chow in a Bag. Cranberry sauce stored in a hefty bag! I want to try the Hefty Batty Bites Popcorn Mix. Holy batman, luv to try the stuffing. Wow, prize amazon gc is fab. & splendid. 2 fingers snap. It is tight, fly & off the chain. Thank you for the awesomeness, the contest, and generosity. 🙂 Pick me, pick me! Dear Santa: I’ve been nice. My X-Mas wish this year is to win this contest. Starving artist here desperately needs the gc to shop and eat. A life changing exp. I want to try that stuffing recipe! I LOVE STUFFING! I would like to make some home-made stuffing. I would like to make home-made cranberry sauce. I would make the Puppy Chow in a Bag. I’d like to make that delicious Gravy! It has to be the Gourmet Bacon in a Bag! OMG YUM! I am going to make the Gourmet Bacon! Sounds delicious. Turkey is definitely a must have for my family. The Hefty Batty Bites Popcorn Mix sounds good to me! The Gourmet Bacon sounds DIVINE! I would love to make the HEFTY BATTY BITES POPCORN MIX. I want to try the stuffing. not sure what happened to my comment but here I go again..
there to help me out doing so..
I’d love to make the Puppy Chow! I want to make cranberry sauce this year for Thanksgiving! I like the ice cream in a bag. What else! GOURMET BACON In a bag! Going to be trying this one! I know my son would love if I made that Candied Bacon!! It looks amazing! The gourmet bacon in a bag looks awesome! I love the idea of making my own Icecream In A Bag! Very clever idea! I would like to make the bacon in a bag for a Thanksgiving Day treat. I would love to make the Gourmet Bacon in a Bag as a Thanksgiving Day treat. It has to be Gourmet Bacon in a Bag, Yummy! The gourmet bacon– i know my family would love it. I have to go with the gourmet bacon. Great Scout, luv to try gourmet bacon . To die for. . Wow, prize amazon gc is fab. & splendid. 2 fingers snap. It is tight, fly & off the chain. Thank you for the awesomeness, the contest, and generosity. 🙂 Pick me, pick me! Dear Santa: I’ve been nice. My X-Mas wish this year is to win this contest. Starving artist here desperately needs the gc to shop and eat. A life changing exp. I would try the HEFTY BATTY BITES POPCORN MIX recipe. The puppy chow in a bag sounds like something i’d like to make. The Gourmet Bacon in a Bag! Gourmet Bacon. Good luck to everyone! I would make the puppy chow. Batty Bites Popcorn Mix is so cute and smart! Best way to use up leftover candies. If there’s even any left! I couldn’t find Thanksgiving recipes but I thought the gourmet bacon looked amazing and I am a huge bacon fan! The gourmet bacon sounds yummy! I’d like to try the Hefty Batty Bites Popcorn Mix! I would love to try the GOURMET BACON IN A BAG r.
The gourmet bacon looks scrummy! I would love to make the GOURMET BACON IN A BAG recipe. I will use some of their tips for the turkey since this will be the first one that I cook at. I’d like to make stuffing muffins. The HEFTY BATTY BITES POPCORN MIX looks fun! I would love the batty bites popcorn mix. I’m going to try the stuffing. My grandkids will love Puppy Chow! I would love to try the Hefty Batty Bites Popcorn Mix!! I am a going to try making the cranberry sauce ahead of time and freezing it to make it easier for me to entertain. Gourmet Bacon would make a tasty appetizer for Thanksgiving. I’l be trying the Icecream In A Bag! Spice Up Your Holiday Eggnog sounds good! I can’t stand turkey, so we never have the traditional meal. We usually grill up some beef tenderloin steaks and saute mushrooms. I like that idea – there’s no reason you shouldn’t make what you like to eat on Thanksgiving! Gourmet bacon in a bag. I will be trying the stuffing. I want to make the gourmet bacon. I would like to make the GOURMET BACON IN A BAG. I’d like to try gourmet bacon! I’l definitely be trying the Icecream In A Bag! Genius! Gourmet Bacon in a bag. Sounds delicious. I will use their turkey tips. I’m going to try the Gourmet Bacon in a Bag. I would like to make the Hefty Batty Bites Popcorn Mix. The Gourmet Bacon in a Bag looks really good. I sould like to make the stuffing. I’d love to try the recipe for spicing up holiday egg nog! Some great ideas! The gourmet bacon in a bag recipe. Ok, so I am Canadian and have already had Thanksgiving but I would love to try GOURMET BACON IN A BAG as we’re big bacon fans here and it sounds tempting! I’d actually like to make some MATZO BALLS to use in soup. What a great comfort food! Nice for an early lunch, since we usually eat out Thanksgiving dinner a bit later in the evening. I am going to try their ideas for the cranberry sauce. Wow, I had no idea Hefty had some much information on their site! I would like to make the PATRIOTIC FRUIT PARFAIT CUPS. I also screwed up this entry in the form. I started to say stuffing…. and when I went to backspace to do the entry correctly, I hit enter. Ughhh!!! I will be making the cranberry sauce for this Thanksgiving dinner..
Iwould like to try the apple crisp recipe. I like the Style Cut Resistant Foam Plates & Bowls. i would love to make everything on this website for my family on Thanksgiving!! such a mouth watering wait. HEFTY BATTY BITES POPCORN MIX. I would love to try gourmet bacon in a bag! Absolutely amazing recipe! I love cinnamon! We don’t have Thanksgiving in Ireland but for Christmas I’ll be trying to make the Icecream In A Bag! The holiday eggnog looks good! My family would like to try the BATTY BITES POPCORN MIX. I’d like to make the Hefty Batty Popcorn Bites. I would say the cranberry sauce. For the simple fact that I’ve never, in my 31 years of life, ever had good tasting cranberry sauce. I’m looking for that one special recipe. I’m going to try the Hefty Batty Bites Popcorn Mix. Gourmet bacon in a bag sounds good to me! I will definitely be making cranberry sauce, we love to have a lot of it during the Holidays! 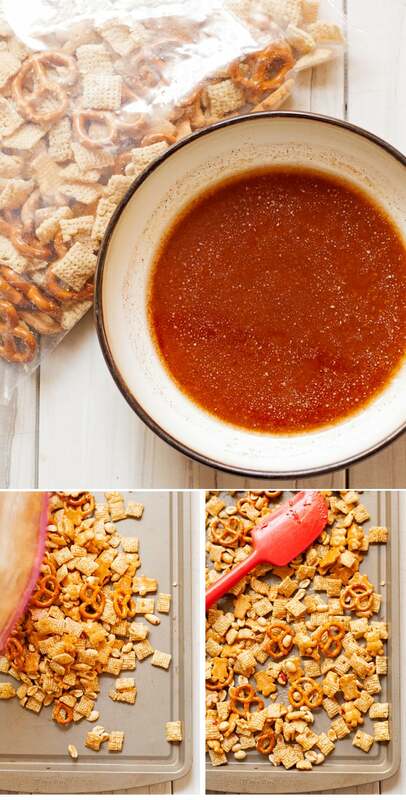 My Family would love to try the CINNAMON SNACK MIX RECIPE !!!!! The Hefty Batty Bites Popcorn Mix would be cute for next year! I’ll be making the Icecream In A Bag! I want to make the puppy chow! Spice Up Your Holiday EggNog with Cinnamon. I like the eggnog ideas. I would make GOURMET BACON IN A BAG. The Icecream In A Bag! I would love to try and make the cranberry sauce! I would like to make the doughnuts in a bag, that would make a good brunch for the day after Thanksgiving. I would like to try the BATTY BITES POPCORN MIX. I would like to try HEFTY BATTY BITES POPCORN MIX. The slow cooker french toast with fruit topping looks so good! The gourmet bacon in a bag. Thank u! Gourmet Bacon in a Bag! Cranberry sauce stored in a hefty bag! I never thought of this before. Love Hefty products. Use them all the time. I would love to make the puppy chow recipe! I would like to try the stuffing recipe. I would like to try the gourmet bacon, it looks yummy! The recipes are fun! I should try them out soon! I would love to make cranberry sauce! I’ll be trying the Icecream In A Bag! I want to try and make the gourmet bacon, yum! Gourmet Bacon sounds terrific. I bet it would be a good adter dinner snack while watching th ball gamee. I dont know if my comment took or not, I would try the bacon bitess, thy wwouldd be great while watching the game. I want to make the Turkey Recipe. I’m going to make Icecream In A Bag! The Gourmet Bacon in a Bag looks great! The Gourmet Bacon sounds really yummy! I would like to make Hefty Batty Bites Popcorn Mix. I’ll be trying the Ice Cream In A Bag! I would love to make the GOURMET BACON IN A BAG recipe. We love bacon. The Icecream In A Bag is the one for me! I would love to make the gourmet bacon in a bag. Puppy chow in a bag would be a great pre=snack for Thanksgiving! Great for watching the Packs vs the Bears! The puppy chow in a bag would make a great snack for Thanksgiving day football game between the Packers and the Bears! I would love to try the gourmet bacon in a bag! I want to make the Icecream In A Bag! Can’t wait! I would love to make PUPPY CHOW IN A BAG for all of my guests to snack on after dinner while playing board games. I’d make the gourmet bacon! I’d make puppy chow as it’s a holiday favorite! I’d like to make the Hefty Batty Bites Popcorn Mix. I’d like to make Icing in a bag. Sounds like fun! I would love to make the puppy chow recipe! I love sweets! I love sweets so I would love the puppy chow. GOURMET BACON IN A BAG!! I want to make the gourmet bacon. It sounds delicious. I’m going to give the Icecream In A Bag a go! The puppy chow is the one i would make. I would like to make Hefty Batty Bites Popcorn Mix next halloween. The holiday eggnog recipe sounds great. I love eggnog! I like the idea of GOURMET BACON IN A BAG. BATTY BITES POPCORN MIX sound perfect to me!!! I would love to try the puppy chow!!!! I really want to try the Gourmet bacon! Icecream In A Bag – love homemade icecream! I love the puppy chow. It’s a family favorite snack. I would love to try the gourmet bacon in a bag!!! I’d love to try the Bites Popcorn mix, it looks yummy!! The puppy chow is the best. Definitely the gourmet bacon in a bag. I’ll be making Icecream In A Bag for Christmas as we don’t celebrate Thanksgiving in Ireland. I’d like to try the ice cream made with salt, ice and a freezer bag. I would like to try Gourmet Bacon in a Bag! The Puppy Chow in a Bag sounds like it would be easy to make and a fun treat. Just the name alone sounds cute and makes me want to try it this Thanksgiving. We like the GOURMET BACON IN A BAG. I’ll be trying the Icecream In A Bag – it sounds foolproof! Gourmet bacon in a bag sounds great. The GOURMET BACON IN A BAG sounds good to me! Gourmet Bacon in a Bag sounds delicious. It’s Icecream Ib A Bag for me! The GOURMET BACON IN A BAG.. Sounds easy! Puppy Chow in a bag! How simple! No clean-up!! I would love to try the gourmet bacon in a bag…yum! Definitely Icecream In A Bag! 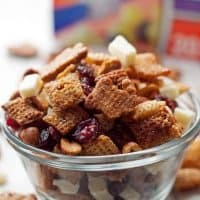 I had never seen anyone else mention cinnamon snack mix until now! I would love to try the gourmet bacon in a bag! You cannot go wrong with bacon. Gourmet bacon in a bag–looks soooo good! I love to try the puppy chow in a bag! Wow…gourmet bacon in a bag…who knew! I bet this is tasty and perfect! I could totally make the Puppy Chow! !